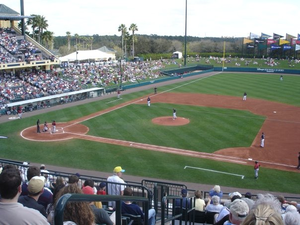 Spring training typically starts in mid-February and continues until just before Opening Day of the regular season, which falls in the last week of March. In some years, teams not scheduled to play on Opening Day will play spring training games that day. Pitchers and catchers report to spring training first because pitchers benefit from a longer training period. A few days later, position players arrive and team practice begins. Exhibition games usually begin around the first of March. Babe Ruth hit a 573-foot home run in spring training, 1918. 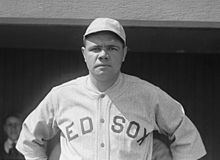 He led the league with 11 home runs and had a 13–7 record as the Red Sox won the 1918 World Series. According to the autobiography of former Cleveland Indians owner Bill Veeck, the avoidance of racism was one reason the Cactus League was established. In 1947, Veeck was the owner of the minor league Milwaukee Brewers and the team trained in Ocala, Florida. Veeck inadvertently sat in the Black section of the segregated stands and engaged in conversation with a couple of fans. According to Veeck's book, the local law enforcement told Veeck he could not sit in that section, and then called the Ocala mayor when Veeck argued back. The mayor finally backed down when Veeck threatened to take his team elsewhere for spring training and promised to let the country know why. 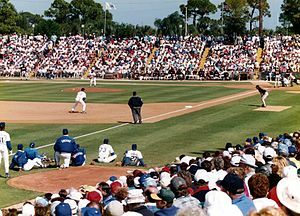 Arizona had eight teams in the Cactus League in 1989, with the other eighteen in Florida. By 2018, the split was even, with 15 teams training in each location. After World War II, some teams trained outside of the United States. The Brooklyn Dodgers trained in Havana, Cuba in 1947 and 1949, and in the Dominican Republic in 1948. The New York Yankees also trained in the early 1950s in Cuba and the Dominican Republic. Spring training camps and games were also held in Hawaii, Puerto Rico, and various cities of northern Mexico, sometimes by visiting major league teams in the 1950s and 1960s. 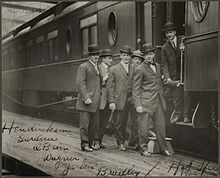 Before and shortly after big league baseball reached the West Coast, a number of teams trained in the state of California or along the state line. The Chicago Cubs trained on Catalina Island in the 1920s, '30s, and '40s. 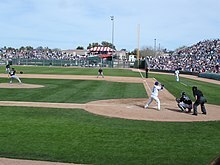 For example, early in their history, the then- California Angels held spring training in Palm Springs, California from 1961 to 1993, the San Diego Padres in Yuma, Arizona from 1969 to 1993, the Oakland Athletics in Las Vegas in the 1970s, and various major league teams had trained in El Centro, Riverside, and San Bernardino. Unlike the Grapefruit League, teams in the Cactus League often share stadiums; of the 15 teams who train in Arizona, only the Cubs, Angels, Brewers, Giants and A's have their own home stadiums. The Cactus league teams are all within the Phoenix metropolitan area. Minor league players participate in spring training following a telescoped schedule that generally lasts from March 1–31. At its conclusion, most players are assigned to full-season Class A, AA, or AAA farm team rosters to begin the regular minor league season. However, those players deemed unready for a full-season campaign—through inexperience or injury—are assigned to "extended spring training", a structured program of workouts, rehabilitation sessions, simulated games, and exhibition games based in the major league parent team's minor league training complex. If a player is deemed ready to participate in full-season league action, he is promoted to an appropriate-level farm club. When the " short season" Class A and rookie leagues begin play in late June, extended spring training players are assigned to those rosters, placed on the injured list (formerly the disabled list), or released. ^ "arlington hotel, oaklawn, gangster museum, hot springs baseball trail, historical landmarks - Hot Springs, Arkansas". ^ a b "Major League Spring Training in Hot Springs - Encyclopedia of Arkansas". ^ "Ban Johnson Park-Whittington Park/Majestic Park/Fogel Field - Hot Springs Arkansas - Major League Spring Training grounds". ^ "From a Fan: Rare Photos of Babe Ruth in Hot Springs Babe Ruth Central: Babe Ruth, Babe Ruth Photos, Babe Ruth Statistics, Babe Ruth Biography". ^ Budd Bailey. "Road Trips!". ^ "Historic Baseball Trail Documenting Hot Springs as Birthplace of Spring Baseball Will Open on March 29; 45 Percent of Hall of Fame, Other Legendary Players Included". Yahoo Finance. 26 March 2012. ^ "Boys of Spring - Arkansas Life". ^ "Larry Foley". Larry Foley. ^ "MLB Network to air 'First Boys of Spring' doc". Major League Baseball. ^ The Arizona Republic: "Cactus League: Then and Now." Source: Rodney Johson, the Society for American Baseball Research. March 6, 2011. ^ Philadelphia Inquirer, March 1889; SABR Spring Training Database, http://sabr.org/content/spring-training-database (restricted access), Retrieved January 25, 2012. ^ Johnson, Rodney (2012). "From Dust to Diamonds: The Evolution of the Cactus League". CactusLeague.com. Archived from the original on 20 April 2008. Retrieved 21 September 2012. ^ Arsenault, Raymond. "Spring Training Baseball in Florida – Our Roots Run Deep". Archived from the original on May 17, 2008. Retrieved May 16, 2011. ^ Veeck, Bill and Linn, Edward (2001). Veeck as in Wreck: The Autobiography of Bill Veeck. University of Chicago Press. ISBN 0-671-67540-0. pgs. 171–172. ^ "Buckhorn Baths: A unique Mesa landmark". ^ "Larry Doby" Retrieved 2010-03-20. ^ Clarke, Ric (March 9, 1989). "Florida lobbies for Cactus League teams". Spokesman-Review. (Spokane, Washington). Cox News Service. p. D5. ^ Hoynes, Paul (17 February 2015). "Cleveland Indians spring training through the years in photos: From New Orleans to Goodyear". cleveland.com. Retrieved 8 October 2018. ^ Suehsdorf, A. D. (1978). The Great American Baseball Scrapbook, p. 103. Random House. ISBN 0-394-50253-1. ^ Echevarría, Roberto González (1988). "The '47 Dodgers on Havana: Baseball at a Crossroads". Spring Training. Vanguard Publications. Retrieved January 10, 2007. ^ "Thomas debuts in B game". Retrieved March 8, 2008. ^ Associated Press (8 February 2018). "Players Union Will Host Spring Training Camp for Free Agents". The New York Times. Retrieved 2 April 2018. 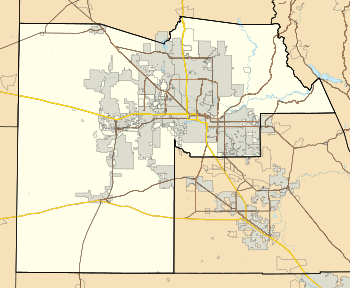 ^ Gardner, Dakota (March 13, 2014). "The amazing story of 'Uncle Robbie' Robinson's plane-assisted grapefruit catch". mlb.com. ^ "Wilbert Robinson". National Baseball Hall of Fame. ^ Semchuck, Alex. "Wilbert Robinson". Society for American Baseball Research. ^ a b "Spring Training Official Website". MLB. Retrieved March 5, 2011. ^ Murdock, Zack (January 17, 2017). 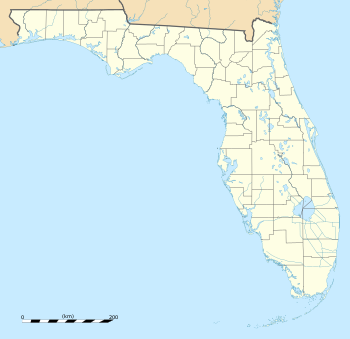 "Atlanta Braves pick Sarasota County for spring training". Sarasota Herald-Tribune. Retrieved February 27, 2017. ^ Rodriguez, Nicole (March 1, 2019). "Atlanta Braves stadium in North Port nearing completion". Sarasota Herald-Tribune. Retrieved March 1, 2019. ^ "Atlanta Braves Schedule, March 2019". MLB.com. Retrieved March 5, 2019. ^ "Arizona Diamondbacks, Colorado Rockies break in new park". ^ The Arizona Republic. "A successful spring: New venue helps Cactus League set attendance mark." Peter Corbett. March 30, 2011. ^ " Martinez, 5 relievers pitch perfect game", Jimmy Golen, the Associated Press, published March 15, 2000, Retrieved February 22, 2007.